I almost forgot that I have a copy of The William Sonoma baking book until I saw Zoe's post on the crisp chocolate bites. You see, the problem with me is I am attracted to recipe books since I started baking 3 years ago. I did a recent count and realised that my collection has almost hit 100! I have to refrain myself from buying any more as I haven't even finish a quarter of the collection and many are still new and shrinkwrapped! I baked these cookies this morning and the aroma of cocoa filled the whole house. This recipe is meant for making crisp chocolate cookies but since I love fudgy and chewy cookies, I made them larger in size and bake at the same timing as what I read in Zoe's blog, the cookies really came out gooey, soft inside and crisp on the outside due to the icing sugar. Zoe, my cookies are huge and almost 5 times bigger than what the original recipe meant it to be and I love it....hehe! 1. In a small saucepan over very low heat, combine the butter and chocolate. Cook, stirring occasionally, just until they are melted and the mixture is smooth. 2. Pour the chocolate mixture into a large bowl and let cool slightly. Stir in the sugar until evenly moistened. Add the egg and vanilla, beating until light and fluffy. 3. Sift together the flour, cocoa, baking soda and salt into the butter mixture. 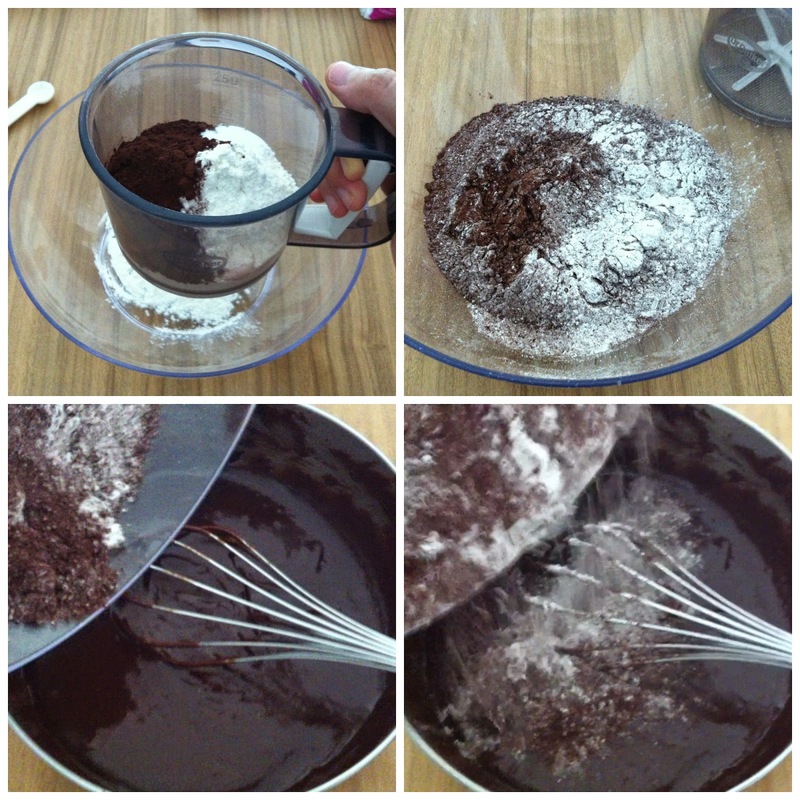 Gradually add the flour mixture to the chocolate mixture and stir to combine. Cover and refrigerate until firm, about 1 hour. 4. Preheat an oven to 170°C top and bottom heat with fan. Line baking trays with baking paper. Remove the cookie dough from the refrigerator. 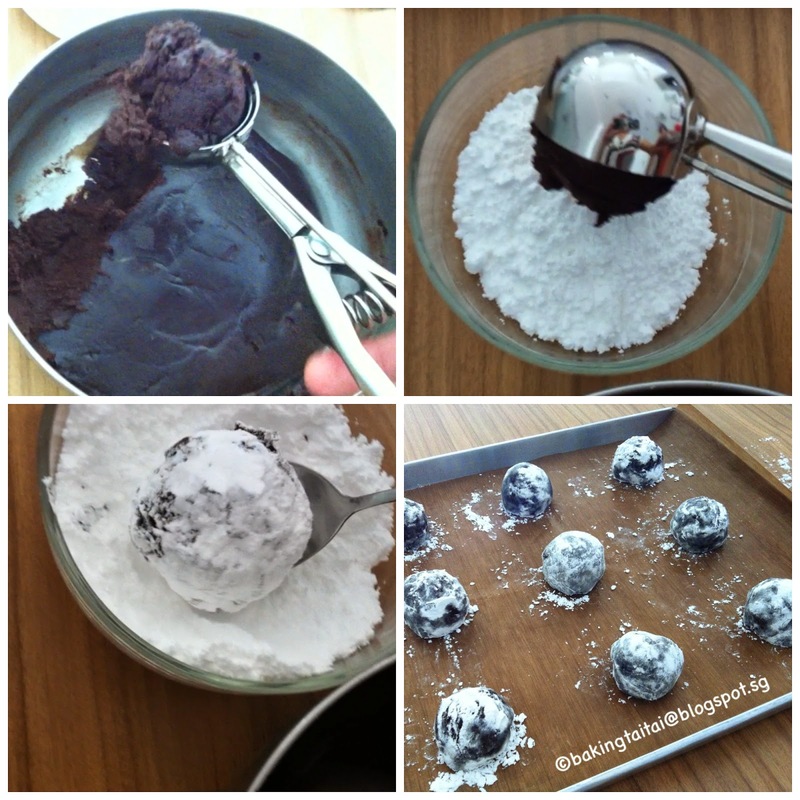 Shape the dough into balls and roll in the icing sugar to coat completely. Place the balls about 4cm apart on the prepared pans. 5. Bake the cookies until puffed and cracked on top, about 12 mins. (it is ok for the centre to appear underdone and gooey) Let cool on the pans for 2 to 3 mins, then transfer the cookies to a wire rack to cool completely. 1. The original recipe can yield 42 small and crispy cookies, I made 9 large crisp and chewy ones and love it to bits! 2. If you like crisp and chewy cookies like me, use 1.5 tablespoon of cookie dough to shape larger cookies. (I use an ice-cream scoop) If you like crispy cookies, use 1 teaspoon of cookie dough to shape smaller cookies and cool them completely for crispier taste. 3. To make really good chocolate cookies, please use premium dark chocolates and cocoa powder. Hi Cheryl, your's are gigantic cookies ! Yummy ... ha ha enough to pass around? Enjoy! Looks like we have something in common., the love for cookbooks! Haha! I have so many too, and would read them in the early morning, daytime and at night! LOL! So mine are all out of their shrink-wraps!! Your cookies look great! My family generally prefers crunchy cookies, but these were gone in two days! Thank you for baking along with us, hope to see you again! Love how pretty crack your cookies have. yummy looking! love that the recipe can tweak to get desired softness or crisp. wow, 5 times bigger..those must be really huge size! i'm glad that you tried out this recipe and liked it. I made them much smaller and followed the baking time , they turned out chewy and crispy too. 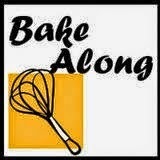 Thanks so much for baking along with us and also nice to know you! see ya! Hi Cheryl, looking at the ingredients you used, I know these crisp chocolate bites are definitely good. I have told Joyce and Lena that I'll bake these. Your post convinced me to bake them soon. Hi Lena, thanks for dropping by and nice knowing you too! Yes, I made huge cookies which even after eating a piece, I'm still craving for more....haha greedy me! Sorry for my late visit :p I actually prefer the larger cookies than the smaller crispy ones. Your large cookies look very yummy!